Wasatch Fencing is a non-profit, volunteer driven organization, which teaches a healthy attitude toward life, competition and respect for others through the sport of fencing. Wasatch Fencing has been teaching Olympic-style foil, epee and saber fencing since 1983. Along with having lots of fun, our fencers are considered to be among the best in Utah and in the nation. Previous members of Wasatch Fencing have gone on to fence for NCAA programs such as Duke, MIT, and Stanford universities. 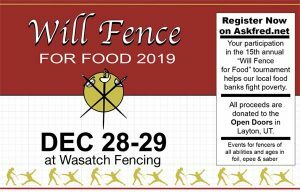 This year’s 15th annual Will Fence for Food tournament generated over a 1,000 pounds of non-perishable food for the Open Doors food bank in Layton, Utah. We had 60 fencers donate food and cash in lieu of registration and event fees. We are so grateful for the willingness of fencers in our division to give back to the community. The decade and a half-old event was the brainchild of Robbie Malcolm, who fenced in Park City and started “Will Fence for Food” as a high school project. Malcolm then went on to fence for and graduated from Princeton. Wasatch Fencing with support from all the clubs in Utah and Idaho have been supporting the charity event ever since. Congratulations Wasatch Fencing’s gold medalists Gabriel Carrier (Y12 foil and epee), Abby Whitesides (Y12 saber), Tatijana Stewart (senior epee), and Jonas Delisle (D3 Saber). Congratulations also to Zachary Kofroth earning his “C” in epee and Gavin Barth his “E” in epee. Wasatch Fencing had 19 medalists overall! Click here for all results. Our LessonOne program will introduce you to the sport of fencing and have you ready for your first bout in about an hour. Once you have completed your LessonOne you can start attending your age group’s practices, which meet on Monday, Tuesdays, Wednesdays, and Thursdays. Contact us and we will get back to you to schedule your first fencing lesson or answer any questions you have. Adult Program Offers Foil, Epee and Saber Fencing for People of All Ages! If you have never fenced before, we suggest taking a LessonOne which is an hour one-on-one lesson with one of our coaches to get you started.